Nota : per questo tour è stata scelta la soluzione di solo pernottamento e prima colazione perché la cittadina offre molte possibilità di ristorantini ove consumare i piatti tipici della cucina locale. Le escursioni proposte saranno possibili in base alle condizioni atmosferiche e alle disponibilità degli organizzatori locali. The location of Ilulissat is breathtaking - all year round huge icebergs raising more than hundred metres above sea level are stranded at the mouth of the fiord. These icebergs are all products of the mighty and most productive glacier in the northern hemisphere; The Ilulissat Glacier daily gives birth to 20 million tons of ice which also explain why it is included on the World Heritage list. During a walk through town the guide tells about the history of Ilulissat. We visit the old part of town and see buildings from the very start of the Danish trading station, the busy fishing harbour, the old church and the museum. Lunch at a local restaurant. By bus as far as the road goes. A beautiful walk along the UNESCO designated Ilulissat Ice Fiord to Sermermiut where traces from the 3 old Eskimo cultures still can be seen. Sermermiut is a fertile valley next to the Ice Fiord; here you can enjoy the flowers as well as the fantastic icebergs. By boat to the small settlement Oqaitsut/Rodebay with a local population of approx. 40 persons totally depending upon fishing and hunting - a quite different world compared to the nearby town of Ilulissat. Guided walk through the village before we will enjoy lunch at the old trading station. The midnight sun and the warm red colours reflecting in the gigantic icebergs is a fantastic sight. Cruise between the icebergs and enjoy a late Martini on "the real rocks"! Season for midnight sun is approx. 22may-24jul. Outside this season the excursion is operated as an evening cruise with the beautiful sunset reflecting over the icebergs. During the stay in Ilulissat the guide will try to arrange an excursion by helicopter - including a ground stop where you can leave the helicopter! During the flight we cruise in low altitude over the Ilulissat Ice Fiord which is now on the UNESCO World Heritage list. Operation is depending on the weather and helicopter capacity. Only to be booked locally! Visit a Greenland home, enjoy the "Coffee-Mik" (a cup of coffee which by tradition is served to all visitors) and learn about Greenland and its population. Eqip glacier is the only glacier in the Ilulissat area where we often experience a glacier calving. We cruise in front of the 5 km wide glacier - enjoying our lunch - and hope for the unique sight of an iceberg “delivery” - so are also a lot of seabirds as they know by experience, that any calving from the glacier will result in a huge meal, when the new iceberg is turning around in the water bringing a lot of sea animals to the surface. 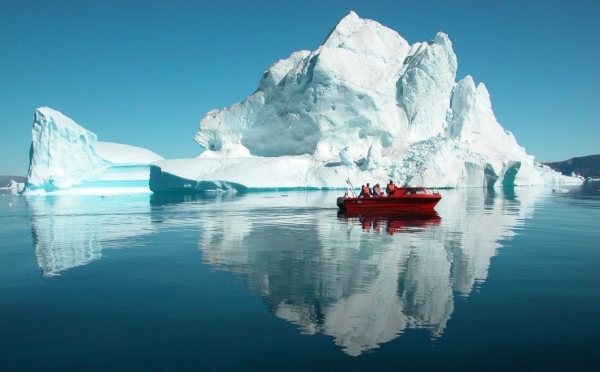 We sail to the fishing spot of the day, most probably near Bredebugt or at the mouth of the Ilulissat Ice Fiord. While waiting for our catch we have time to enjoy the beautiful surroundings. By the end of the day we will hopefully bring home different sorts of fish like cod, halibut, redfish and catfish. By boat we go out into the Disko Bay to spot whales. In the summer time humback whales come to the Disko Bay to feed on the capelin, a small herring-like fish. As the humback whales are protected they are very trusting and can often be enjoyed at close range. However, as this is not a zoo there is of course no guarantee for seeing the whales.